An archive of interviews with people who have worked in Minnesota journalism dating back to the 1940s. The portion of this project funded by a Minnesota Historical Society Legacy Grant ended on June 30. The final tally was 24 interviews with Minnesota journalists from across the decades. This site archives the audio recordings, PDF transcripts, photos and short bios of each journalist. All documents can be used for non-commercial uses with attribution under a Creative Commons license. If you noticed any typos in the hundreds of pages of documents, please let me know. Although I'm pretty happy with the end result (and hopefully learned from mistakes I've made), I'd like to continue the project on my own to gather a more diverse picture of Minnesota journalism. The interviews I was able to conduct during the first portion of the project sadly didn't include many journalists from the ethnic or alternative media, two main interests of mine. If you have suggestions of more people I should interview, from any part of the Minnesota journalism world, please pass on their contact information. Even almost two decades after she retired, Marilyn Bailey has an eye for copy editing. She notices when a story jumps abruptly to another page or when a name is awkwardly hyphenated at the end of a line. Bailey grew up in North Dakota, the daughter of German immigrants. She took two years of junior college before transferring to the University of Minnesota, where she joined the Minnesota Daily and worked her way up to news editor. Immediately after graduation in 1954, she started work on the copy desk at the Star Tribune, where she remained until her 1991 retirement. Note: Because of technical difficulties, this recording is split into two parts. Although he had an academic background, St. Paul lifer Dave Healy's first essay for the Park Bugle came after being hit by a car while crossing the street at Raymond Avenue and Energy Park Drive. That essay on pedestrian rights led to regular commentary and feature writing for the paper. Healy went on to edit the Park Bugle for a decade. The Park Bugle was started in 1974 as a non-profit. 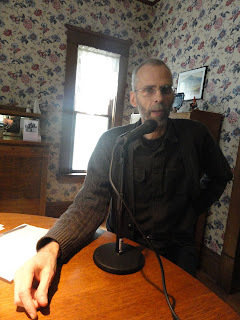 This interview was conducted at Healy's St. Paul home on May 20, 2011. I conducted the interview with Timberjay publisher Marshall Helmberger in his house, which he built in the early 1980s, near Soudan, Minn. The house is off the grid, the solar electricity made my recorder buzz so badly I had to unplug it and use my backup batteries (thus the rough start to the recording). Helmberger fell into journalism by chance, but his paper quickly gained recognition as a force for powerful local investigative journalism (a rarity these days). The Timberjay, which publishes three weekly editions out of three offices, doesn't earn much profit, he said. But it has reaped numerous journalistic accolades for public affairs reporting. The interview was conducted May 7, 2011, near Tower, Minnesota. Randy Furst walked into the office of a Minneapolis Star editor and said, "I'll do a hell of a job for you." A year later, he had a job as suburban reporter at the Star. But his professional career really started as editor of the Fridley Sun, writing articles, editorials and laying the paper out each week. The first Fridley city council meeting he attended as editor, the council voted to pull legal ads from the Sun because of coverage of cable television companies (one of which the city supported and one that the newspaper's owners supported). In his career at the Star Tribune, Furst has gone on to win a number of awards for his coverage, including in-depth reports of the Minnesota Gang Strike Force. 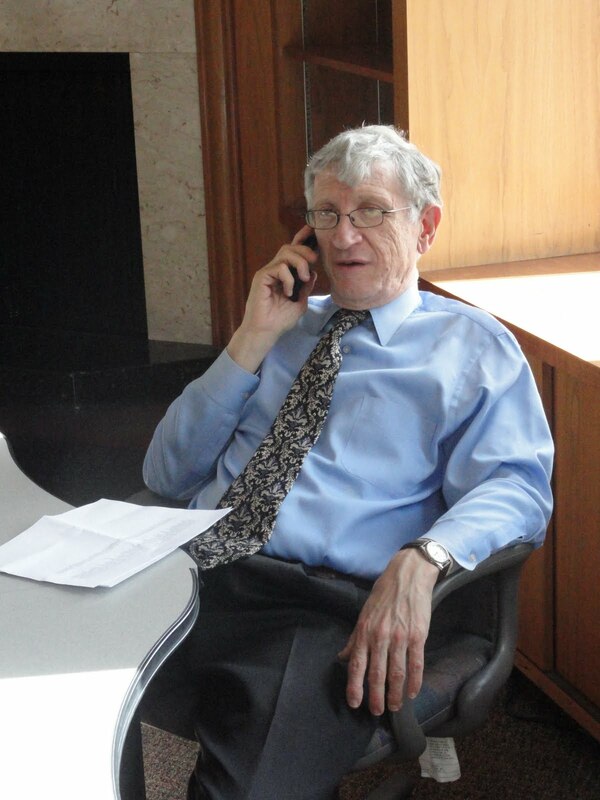 This interview was conducted in the offices of the Star Tribune in downtown Minneapolis on April 12. (Pictured: John and Norma Finnegan in front of a huge amount of journalism awards). "I never wanted to be anything else but a journalist." John Finnegan went to school in Minneapolis in the 1940s and worked at his family's hotel in Walker, Minnesota, during the summer. Soon after he graduated from high school, Finnegan took over the editorship at a Robbinsdale community newspaper. A few months later, he was drafted into the army in World War II. Finnegan was an early advocate for government transparency (having helped fight for the Minnesota Data Practices Act). He also was a union activist who helped publish the St. Paul Sentinel in 1957-1958 during a strike at the Pioneer Press. He later was promoted as executive editor and assistant publisher of the St. Paul Pioneer Press. "I have really enjoyed being involved at a time when newspapers were important, were important for the public and were important for me. I've been gratified at the opportunities I've had over the years to be in this business. I must say I've been well-rewarded for it.[...] I wouldn't have done anything different." This interview was conducted at the Finnegans' home in St. Paul on March 28. John Finnegan's account of his WWII service is also here. Eric Eskola got his first job at KDAL in Duluth as a film librarian. Drawn to politics, Eskola enjoyed the autonomy of radio and was honored to be hired at WCCO News Radio in 1980. "Watergate turned reporters into these kind of white knights on horses exposing corruption at the highest levels of government," he said. "Reporting was, I don't know if it was a popular profession, but again, it was a glamorous profession." Eskola stands out in my own memory because WCCO is such a Minnesota institution—I remember my grandparents' radio tuned to WCCO when I visited in the 1980s. In the 2000s, when I started work as a reporter for a small network of newspapers at the sometimes confusing State Capitol, Eskola was friendly, modest and supportive. Eskola continues to delve into politics in regular appearances on TPT's Almanac. This interview was conducted at TPT headquarters in downtown St. Paul at March 25, 2011. This project is funded in part by a legacy grant from the Minnesota Historical Society. All oral interviews are being made available in raw form here, as well as donated to the Minnesota Historical Society and other media archives. The Twin Cities Media Alliance kindly agreed to provide fiscal sponsorship of the project. Please don't hesitate to contact me with any suggestions or comments. My name is Jon Collins. I'm a Minneapolis-based journalist with an interest in history. You can follow my work at my online portfolio at www.jonstrandliecollins.com.